The metal-clad Honor 7 is one of the best value-for-money premium handsets you can get right now, with a compact aluminum unibody, 5.2" 1080p display, a 20 MP rear camera, and a finger scanner on the back. It's already been announced and selling pretty well, including with an official presence in Europe, but back in the spring we saw another handset leaked out, which resembled the Honor 7 design. It looked with a larger display, though, and at the time it was said that there will be an Honor 7 Plus in the making as well. 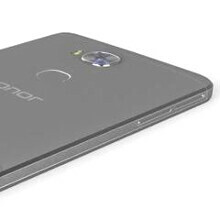 Well, that Honor 7 Plus has now been fleshed out a bit more, and even rendered in the video below, based on leaked dimensions. It will apparently come with a larger, 5.5" 1080p screen, and feature 151.4x76.3x7.9mm dimensions. As to what other specs are in store, we'd wager to guess they will be similar to the Honor 7: a Kirin chipset, 3 GB of RAM, and a 20 MP Sony sensor on the back. The phone will, obviously, sport Huawei's signature fingerprint sensor on the back, too, and likely run Android 5.0 Lollipop, skinned with Huawei’s Emotion UI. I think this will have that monster kirin 950. It will probably come with Kirin 940 . Mate 8 will come with Kirin 950 and EMUI 4.0 . STOP IT !!!! HOW MANY DEVICES HAVE THEY RELEASED THIS YEAR????????? Not enough ... lol they need as much as Samsung ! @Phonearena when will review be ?